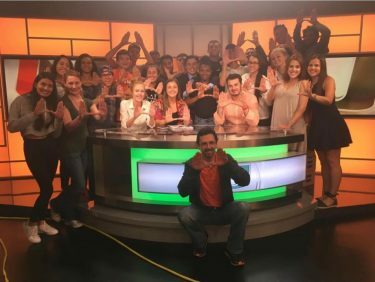 Students at the University of Miami took a break in between classes and travelled back in time at Hurricane Productions’ (HP) Throwback Tuesday event at the Rock. HP provided a much needed pick-me-up, inviting students to hang out with friends, grab free merchandise and treat themselves to a selection of candy and free Ben and Jerry’s milkshakes. HP strives to create and carry-out student events on campus. These events range from giveaways, to festive themes and live performances. Amanda Perez, a junior majoring in neuroscience and history who currently serves on the executive board of Hurricane Productions, said that there are about 10 people on the committee who vote on different themes and events. Based on the vote, the members would then start the planning process about a month in advance and decide on possible activities and vendors that will fit the campus event. The organization also sends out surveys to gauge the interests of students. The topics of these surveys range from possible vendor ideas to food preferences. Students rotated through multiple stations that offered memorabilia, music and fun activities from the 60s, 70s, 80s, 90s and early 2000s. The event included: milkshakes with a 60s theme, 70s tie dye shirts, arcade games from the 80s, slap bracelets, slime, a 90s candy bar and music from the early 2000s. Jane Perlman, a junior majoring in ecosystem science and policy, was one of many students lined up at the event eager to get a free milkshake. Perlman said that free events like Throwback Tuesday create a sense of community on campus and allow students to unwind from their hectic schedules.